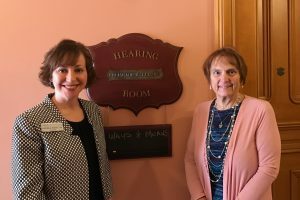 On March 22, 2017, Kay Hill, EA and Angela Radic, EA testified before the Ohio House Ways and Means Committee in favor of Governor Kasich’s proposal to centralize the collection of municipal business net profit tax returns. Ohio has over 600 municipal tax districts, and the current filing process for business operating in multiple districts is cumbersome and paper intensive. Hill and Radic did temper their endorsement with the caveat that the Ohio Business Gateway (OBG), the platform that would be used for the centralized filing system, must be bolstered to support the additional traffic that the system would bear. OBG is currently prone to shut-downs and lock-outs, which can make its use frustrating for individuals and tax professionals. Members of the committee posed questions regarding whether the existing e-file system could be expanded to accomplish the same goal, and the additional tax preparation fees that business owners bear under the current system. This entry was posted in Blog on March 27, 2017 by c06552012.